In this week’s episode, we’re going to ‘Spring into Spring’, with a little chat first and then a meditation. To create the right atmosphere, light a candle, grab some lavender oil and put up the Do Not Disturb sign. In the video below, I’m going to talk a little bit about planting the seeds of your desire before I guide you through the meditation, and there is also a downloadable audio of the meditation for you at the bottom of the page. So if you don’t feel like watching me guide you, you’ll be able to listen to it yourself – and use it again anytime you want to inspire that feeling of hope that spring creates. A few weeks ago, I did an episode on psychological spring cleaning – out with the old and in with the new – now it’s time to create. This season is a time for planting, for making decisions, seeding your intentions for what’s to come. To maximize the fertile energy of spring, please write down what you want to create, attract, or draw into your life. Harness the mind-blowing power of your intention to shape what happens next by getting clear about your desire and feeling the feelings of already having it. Please find a comfortable place where you can sit or lie down for the next eight minutes or so, make sure you are physically comfortable and won’t be disturbed. You can either let this video play and I’ll guide you through the meditation, or use the downloadable audio of just the meditation itself to take you through our shared journey. 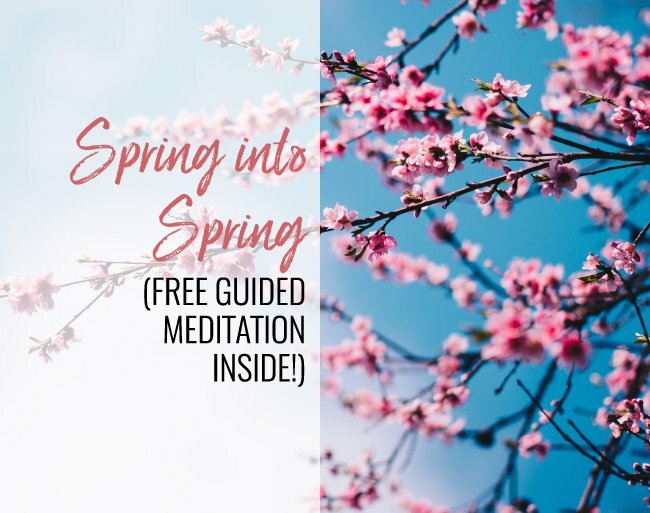 I hope that you enjoy your ‘Spring into Spring’ meditation and visualization. If you do, please share it with the people in your life on your social media channels. I hope you have the most amazing week – planting your intentions and watching them bloom.